BRYAN EATON/Staff photo. 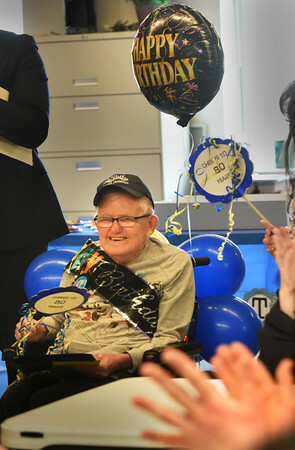 Lifelong Newburyport resident Melvin Russell smiles as staff and fellow clients at Opportunity Works sing "Happy Birthday" for his 80th on Monday. Until several years ago he was often seen in downtown Newburyport greeting everybody with a smile and a "hi buddy" while picking up cans and bottles to recycle but also picking up and disposing of litter. He is the longest client still at the facility and works two hours a week in a job involving recyling and received recognition from Newburyport Mayor Donna Holaday and state Rep. Jim Kelcourse who both attended Monday.